Lose Up To 5 Pounds in 24 Hours! For 24 hours enjoy a special formulation of all-natural juices and botanical extracts. You will flood your body with vitamins, minerals, antioxidants that detoxify your body while you shed pounds. Success is only 24 hours away! For temporary weight management or an ideal jump start to any diet! Lose weight naturally while you cleanse, detoxify and rejuvenate your body. Mix one 4 oz. serving of concentrate with 4 oz of bottled water. Sip over the next 4 hours. Repeat this 3 more times during the rest of the day. In addition, drink at least 8 glasses of water. For best results use twice a week. 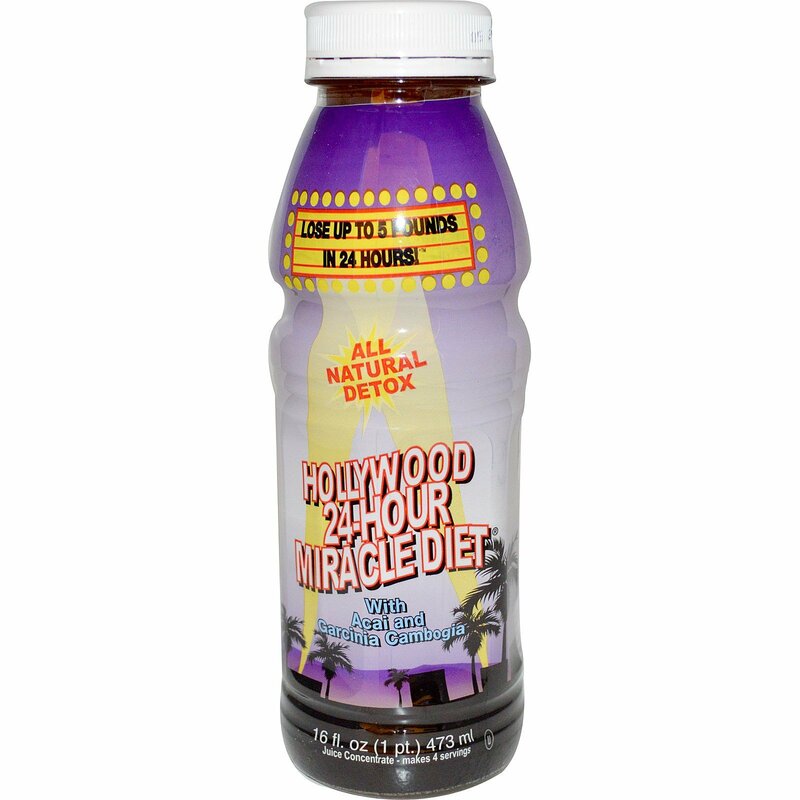 After completing the Hollywood 24-Hour Miracle Diet, maintain a sensible eating plan and exercise regularly. 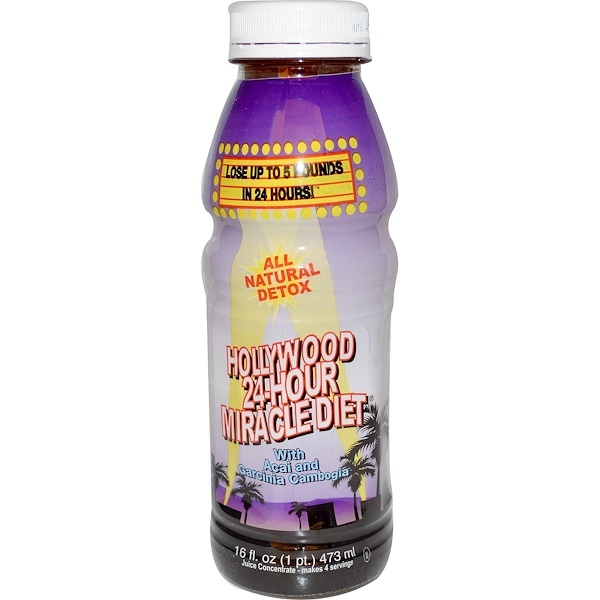 Important: For best results do not consume food, alcohol, caffeine or tobacco while on the Hollywood 24-Hour Diet Miracle Diet. 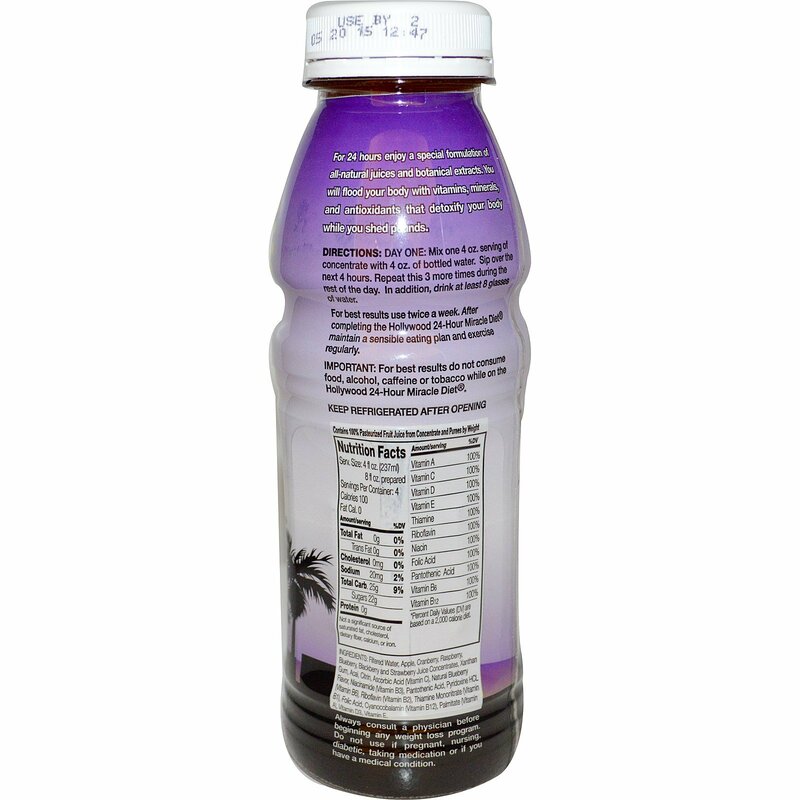 Filtered water, apple, cranberry, raspberry, blueberry, blackberry and strawberry juice concentrates, xanthan gum, acai, citrin, ascorbic acid (Vitamin C), natural blueberry flavor, niacinamide (Vitamin B3), Pantothenic Acid, Pyridoxine HCL (Vitamin B6), riboflavin (Vitamin B2), thiamine mononitrate (Vitamin B1), folic acid, cyanocobalamin (Vitamin B12), palmitate (Vitamin A), Vitamin D3, Vitamin E.
Contains 100% pasteurized fruit juice from concentrate and purees by weight. Always consult a physician before beginning any weight loss program. Do not use if pregnant, nursing, diabetic, taking medication or if you have a medical condition. Not a significant source of saturated fat, cholesterol, dietary fiber, calcium or iron.